The Mega Combi Standard CMC5 oil boiler by Mistral is a floorstanding unit which has been designed to fit underneath a worktop. 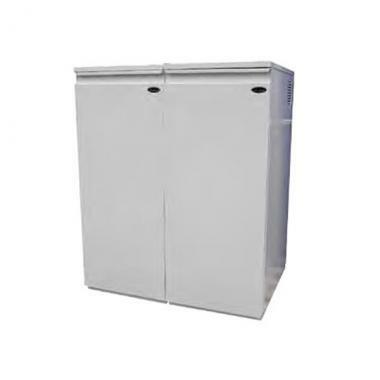 It is finished in double width high quality white casing which is supplied in two parts to allow for easy handling. It also has a removable front for easy servicing access. This boiler uses condensing technology to deliver a high efficiency rating of 90% making it an A rated appliance. The 50kW output rating makes it ideally suited for the larger home with a higher demand for heating and hot water. This boiler is also available as a non-condensing model for either indoor or outdoor installation. Other output sizes range between 41 kW to 70 kW. The multi directional flue outlet enables a quick and easy installation when used in conjunction with the pre punched pipe entry points on both the side and back of the boiler. As a Combi boiler it will supply hot water and heating on demand directly from the mains water supply. This means you don't need to have bulky tanks or cylinders making it perfect for homes where space maybe limited. The boiler includes a 5 year warranty so you can rest assured that you’ve invested in a high quality appliance for your home.